Though the Baltimore Ravens are a team devoid of superstars, their players are still finding themselves represented on many media year-end lists. On Monday, Pro Football Focus revealed that Ravens cornerback Marlon Humphrey and guard Marshal Yanda made their annual Top 101 players list at No. 97 and No. 99, respectively. In mid-January, PFF also named Humphrey as the No. 13 cornerback in all of football. 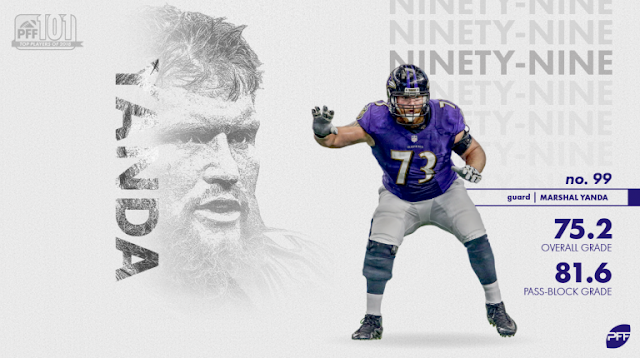 Unlike Humphrey, the veteran Yanda is no stranger to this list, with seven appearances in 12 seasons. At age 34, Yanda still continues to play at a high level. He allowed no sacks this season — keeping alive his sackless streak that spans back to Week 7 of the 2015 season — and ceded only three quarterback hits and 12 hurries. Yanda also notched his seventh Pro Bowl appearance and fifth second-team All-Pro selection.